A beautiful concert body with single cutaway and slim neck for more playability, and gorgeous sunburst for more visual appeal. Designed for recorded acoustic guitar performances, the Studio Concert captures all the sparkling detail and nuance of your performance. The maple back and sides offer a clear, precise tone that rises above the mix. This instrument shines when both micd with your favorite external condenser mic and when plugged in using the Fishman INK3 USB. The Breedlove Concert is the original Breedlove shape. 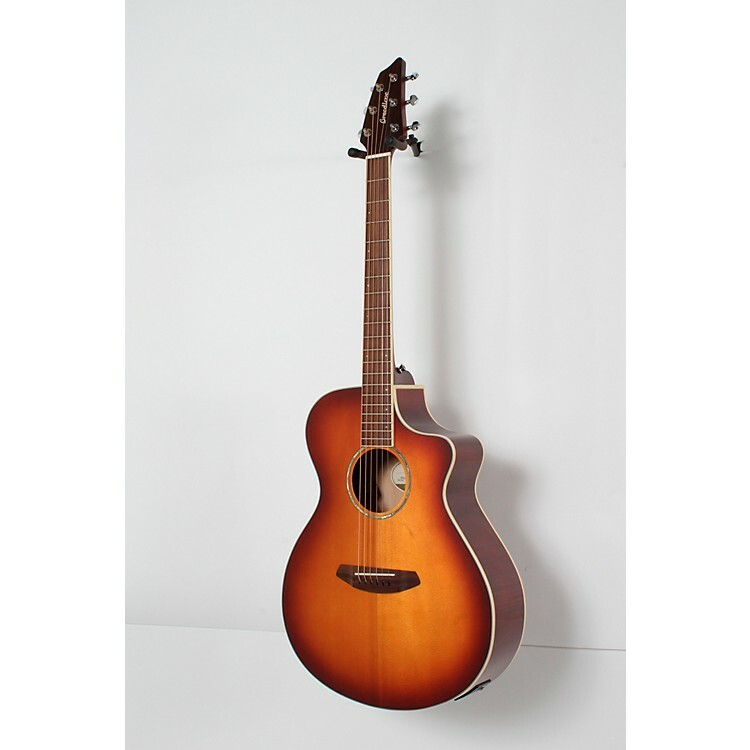 It first appeared in 1992, and has been the best-selling Breedlove body shape ever since. Designed specifically for the fingerstylist to be well-balanced, compact, and comfortable to play, it generates a wonderfully articulate range of tone with an ample low end that is never boomy, but always felt. The unique construction also allows the Concert to sing even at a full strum. If you'e a fingerstylist, or are seeking an instrument to use as vocal accompaniment, this is the shape for you. The Concert is engineered to provide exceptional sustain with a pronounced bass response, both of which can be achieved with a light touch. The graduated top works in harmony with the Breedlove Bridge Truss to provide an even response throughout the lows, mids, and highs, with sustain, and clear, concise, note-for-note projection. The Breedlove Bridge Truss (BBT) reduces tension on the soundboard of the guitar, so the top wood is able to vibrate more freely, producing remarkable sustain, balance, and clarity. The BBT also allows for a thinner graduated top, thereby allowing Breedlove craftsmen to bring out the optimal sound from the top wood without sacrificing structural stability. Relieving much of the string tension from the bridge prevents "bridge belly," ensuring top stability for decades. Guitar strings can exert up to 230 pounds of pull from the nut to the bridge. Traditional methods for preventing top bowing at the bridge usually involve heavy internal bracing and thicker tops. The BBT compensates for this pressure in an innovative way: The BBT is mounted to the bridge from the inside and is connected into the tail block of the guitar, pulling downward on the underside of the bridge to distribute some of the tension, relieving pressure on the top. The resulting tonal effect on BBT-equipped guitars is more resonance and livelier sound with enhanced overtones. The Breedlove Pinless Bridge helps maintain the integrity of the top by eliminating the need for six drilled string holes. The fewer holes in your soundboard, the more evenly the sound wave can move across the interior, without any loss of energy. The Breedlove Pinless Bridge also provides a gentler string-break angle from the bridge to the top of the saddle, reducing saddle strain. This innovative bridge also makes string changes a breeze, especially on 12 strings. Plus, you™ll never again have to worry about lost, worn-out, or broken bridge pins. Order this American original today!